Last week, I shared our experience enjoying the Seasonal Winter Menu at LongHorn Steakhouse, and I introduced the amazing Seasonal Food for the Senses Experience Box that they sent for me as well. This amazing box contained many of the key ingredients that LongHorn’s chefs used to inspire their latest culinary creations. 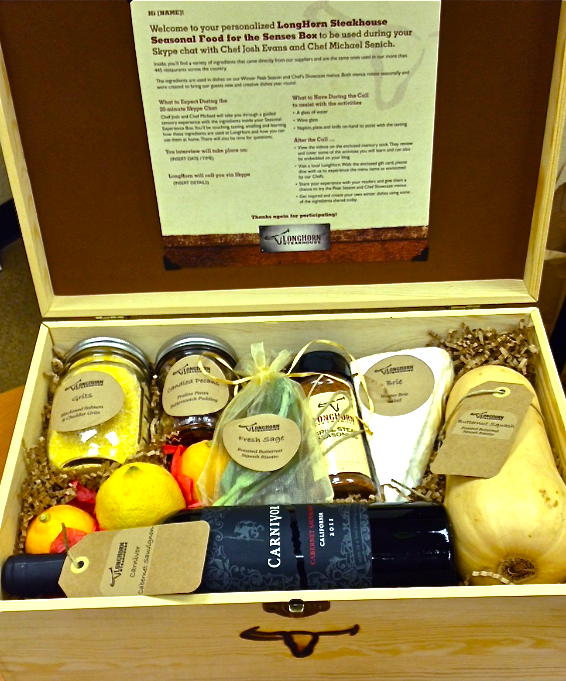 The box included grits, candied pecans, brie, butternut squash, steak and grill seasoning, fresh sage, Meyer lemon, and a bottle of Carnivor -- this season’s featured wine. LongHorn encouraged me to use the ingredients to create my own recipe featuring these peak-season ingredients. 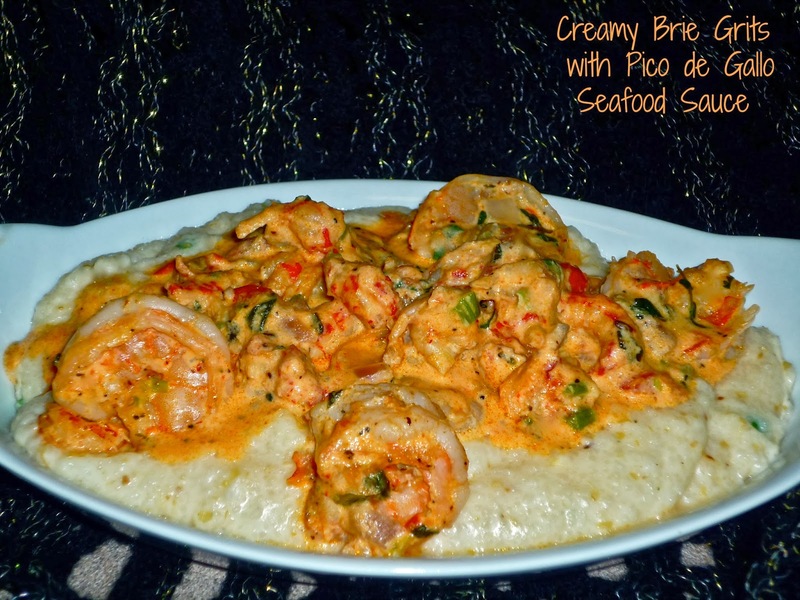 My original creation is Creamy Brie Grits with Pico de Gallo Seafood Sauce. I used the sage, grits, brie, grill seasoning, and Meyer lemon from the box to create this comforting dish. If you’re a fan of shrimp and grits, this dish will knock your socks off. Rich, cheesy grits are topped with a creamy sauce that features pico de gallo, crawfish, and shrimp. With Lent coming, this will be a great addition to your Friday dinners! I had never used brie in my cheese grits, but it worked perfectly. They came out creamy and rich after being cooked in a combination of half and half and chicken stock. Store-bought pico de gallo saves time, letting me whip up the seafood sauce while the grits cook. Once the shrimp were peeled, I was able to complete this dish in just over 30 minutes. If you don’t have access to crawfish tail meat where you live, you can certainly use all shrimp in this recipe. I added the sage and Meyer lemon to the seafood sauce, along with a bit of fresh thyme and garlic. The sauce is lightly spicy, but you could add a finely diced seeded jalapeno if you want to up the spice factor even more. I won’t tell. Step 1: Add the chicken stock and half and half to a large saucepan over med-high heat. Bring to just under a boil, then gradually whisk in the grits to prevent lumps. Reduce heat to medium-low, cover, and cook for 10 minutes. Give it a stir every few minutes to prevent sticking and ensure the grits stay creamy. After the grits are cooked, add the grated brie, butter, green onions, and black pepper. Stir until the cheese melts and the grits become creamy. Turn heat to low, cover the saucepan, and let the grits sit while you make the seafood sauce. Step 2: Add the olive oil to the hot skillet. Add the garlic and cook until fragrant. Season the shrimp and crawfish with the grill seasoning, then add to the pan. Cook until the shrimp turn pink. Add the lemon zest, lemon juice, sage, and thyme. Stir to combine and cook for 1-2 minutes. Step 3: Add the pico de gallo, half and half, and green onion. Stir to combine, raise heat to med-high, and bring to a boil. Cook until the sauce reduces and thickens, about 5 minutes. To serve, spoon the cheese grits into a bowl. Top with a third of the seafood sauce and additional sliced green onion, if desired. Man is this comfort food dish ever good! The grits are sublime – creamy and cheesy, with a slight oniony background flavor. The seafood sauce is creamy, spicy, and full of shrimp and crawfish. Together, this one-bowl meal is a great combination of flavors and textures. Michael and I both loved the flavors in this dish…and I even had enough grits leftover to reheat for breakfast the next day. Simply add a bit more milk or half and half and microwave until it becomes rich and creamy again. Trust me…you want to make this dish ASAP. It’s that good! Disclosure: To facilitate this post, LongHorn Steakhouse sent me a Seasonal Tasting Box containing many of the ingredients used in this dish. All opinions expressed are my own.